Measurements: 2.9 x 4.3 inches; or 73 x 110 millimeters. Back of card: Abstract reddish circles with black line scribble in center. Booklet included: Yes, by Osho, 7 x 4.75 inches, or 180 x 120 mm, 176 pages, illustrated. Publisher: St. Martin's Press. Printed in Belgium by AGMuller. Comments: The transcendental game of Zen: The Osho Zen Tarot focuses on gaining an understanding of the here & now. Events in the outer world reflect our own thoughts & feelings, even though we may be unclear about what those thoughts & feelings are. 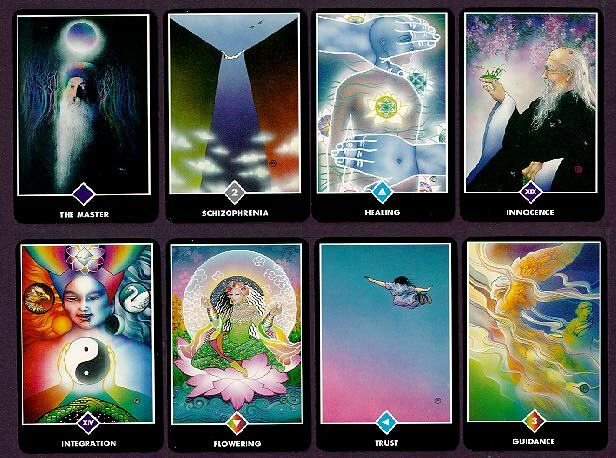 We find many of these cards particularly evocative of astral states & are ideal for meditation. Those familiar with the work of C.W. Leadbeater will find many of the images revealing in more than a casual sense. Titles on the cards are evocative nouns or verbs. Cards are organized by color or symbol (small diamond on bottom). There's also a Roman numeral series.